If you look south around 8 p.m., you will easily notice a short, straight row of three medium bright stars. These stars represent the Belt of Orion the Hunter. Also, notice the star Sirius. On old sky maps, the mighty Hunter of the ancient myths is seen poised with an upraised club and shield, as though fending off the raging Bull, Taurus. Meanwhile, two meek animals seem to cower at the Hunter’s feet. Lepus the Hare was described by Roman stargazers as being “swift,” “light-footed,” and “eared.” Columba the Dove can be found to the south of the Hare. 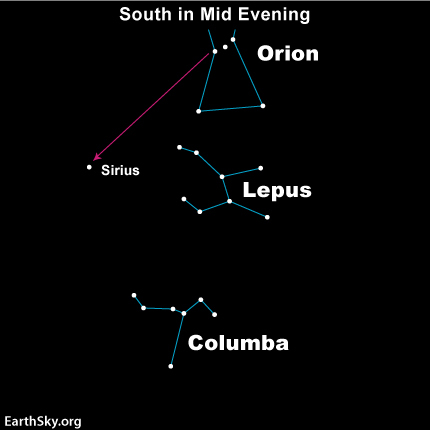 This little constellation is sometimes ignored in books about the sky, probably because it is so far south as seen from the U.S. Richard Hinckley Allen, in his classic book, Star Names: Their Lore and Meaning, wrote that Columba was first seen in constellation drawings in 1603. But, he said, there are hints in early writings that stargazers knew the name Columba, and identified a Dove here, as long as 17 centuries ago. Site contents copyright © 2019 Recorder Online	except as noted. All rights reserved. | 88 queries in 2.141 seconds.